The film came out on the occasion of Godzilla's 50th anniversary, and that date, coupled with the increasingly shaky box office performances of the Godzilla films in Japan, led Toho to conclude that it was the right time to put their most famous daikaiju in ice for a time to allow people to miss the big lizard and get excited for its return (whether it was decided on purpose that it should be exactly ten years until Godzilla's return, or if that was a serendipitous accident, I couldn't say). In the meantime, no expense would be spared and no stop would be left un-pulled in making Final Wars the most over-the-top exciting Godzilla movie that could ever be seen by mortal eyes. That it ended up flopping at the box office, with some of the lowest attendance numbers in the franchise's history, is a sad ending to the story, but it brings us back on point: this is a damned divisive movie, though one where the side that dislikes it has always been larger and more vocal than the side defending it. Too much of the film is too dizzying in its ebullient desire to please for me to go so far as to say that I hate the movie, but I'm going to have to side with the majority on this one. If Final Wars has more than its share of good ideas, that's in no small part because it has so many ideas, period: writer-director Kitamura Ryuhei (collaborating on the screenplay with Kiriyama Isao, working from a story by Mimura Wataru and Tomiyama Shogo) apparently lacks whatever filter it is that causes other directors to limit themselves only to the scenes, characters, and concepts that can fit into an individual movie, going instead for a film that contains basically everything it can't in its very indulgent 125-minute frame (by a considerable margin, the longest Japanese-made Godzilla film ever). It's a grab bag of narrative and aesthetic notions jammed all together with no sort of reflection or restraint, and while this gives the movie a deeply appealing "anything can happen!" sense of scope and popcorn movie energy, it also makes it an exhausting thing to watch, building up no momentum to speak of as it flits from one thing to the next, mixing styles and moods without stopping to notice that this makes those 125 pass by very slowly indeed. Notionally, Final Wars is a movie all about Godzilla fighting damn near every other kaiju from the first series of Godzilla films; in practice, Godzilla spends virtually the entire first half of the movie buried under the Antarctic ice cap, and the other monsters only put in limited cameos until the back half as well. In their place, Final Wars boasts one of the most unrelentingly tedious plots the series ever whipped up. Seems that in the 50 years since Godzilla appeared, giant monsters have become an international concern, leading to the formation of the Earth Defense Force, which succeeded, many years ago, in burying Godzilla beneath the ice, with their best air-battleship, the Gotengo (English speakers might better know it as the titular ship of the 1963 Atragon). Since then, the world has changed dramatically; a new race of mutant humans has come along, and been absorbed into a special fighting force within the EDF, which continues to fight monsters whenever they crop up. Following its graphic-heavy, almost nonlinear opening, the movie proper opens with the Gotengo fighting one such creature, the sea serpent Manda (also from Atragon), and then gets down to the actual business of its story: an ancient monster mummy has been discovered and the UN - currently headed up by the first-ever Japanese Secretary General, Daigo Naotaro (Takarada Akira, who appeared in several of the earliest Godzilla films) - has sent a biologist, Otonashi Miyuki (Kikukawa Rei) to investigate. She's to be protected by Ozaki Shinichi (Matsuoka Masahiro), one of the EDF mutants; before they get a chance to do anything, though, they're visited by the Twin Fairies of Infant Island (Nagasawa Masami and Otsuka Chihiro), prophesying that something huge is about to happen, and it will intimately concern Shinichi. Just like that, a wave of monster attacks breaks out over the globe, and though the EDF tries its best, they can't do much. Luckily, some aliens that just happen to drop by are able to wink all of the monsters out of existence; calling themselves the Xiliens, they bring tidings of a planetoid called Gorath - from 1962's Gorath - that's due to hit Earth, and they offer to help out with that too. It's to the film's credit that it almost instantly reveals that the Xiliens are lying bastards, and the human heroes figure it out almost as quickly - Shinichi, Miyuki, reporter Otonashi Anna (Mizuno Maki), and the American Douglas Gordon (Don Frye), captain of the Gotengo. For what feels like ages, they fight to prove the Xiliens are bad news, and once they've done so, it clears the way for a giggling psychopath with no given name (he's played by Kitamura Kazuki) to take over the invasion force, bring back all the monsters, and proceed to wipe out humanity. Gordon, ruthless pragmatist that he is, suggests reviving Godzilla to fight the other kaiju while there's still hope. And so it is done, and there are many kaiju battles intercut with many human vs. Xilien battles. The thing that is best about Final Wars is the massive scale of its bestiary: Godzilla, Manda, Gigan (the ancient mummy), Rodan, Anguirus, King Shisa, Kamacuras, Kumonga, Ebirah, Mothra, Minilla (communicating in a raspy hum that makes me hate the character more than I ever did in its lousy '60s films), and King Ghidorah all appear (a nice mix of the obvious and the almost idiotically obscure), as well as a special cyborg-skeleton, I-don't-know first form for King Ghidorah, referred to as Monster X. And there's even a cameo for the Fauxilla of 1998's misbegotten American Godzilla (rechristened "Zilla" at this time) done up in limp CGI and set against a lousy Sum 41 song, both of which I take to be deliberate jabs at the shittiness of the Emmerich/Devlin monster, especially coupled with how damn quickly Godzilla takes the imposter down. Not that it takes very long for any of the fights to unspool; if one of the things that Final Wars succeeds at most is gathering all of these creatures together and giving them brand new state of the art suits - the slight redesigns on King Shisa and Gigan are excellent - in the name of wanton fan service, one of the worst failures is the almost perfectly uniform creative poverty of the fight choreography; only the Godzilla/Monster X fight has any real creativity to it, though the Mothra/Gigan fight ends on a decent enough punchline. The tag-team battle that finds King Shisa, Rodan, and Anguirus all fighting against Godzilla is a particularly dire moment, ending as it does with some visual references to football (real football, not American football), something I would have preferred not to crop up in my Godzilla movies. And even setting aside the choreography, all of the fights are simply too short to build up any kind of momentum or excitement, anyway. The thing is, for reasons best known to himself, Kitamura wasn't interested in just making a Godzilla film; he apparently wanted to make some kind of unholy hybrid of Godzilla, The Matrix, and Star Wars. 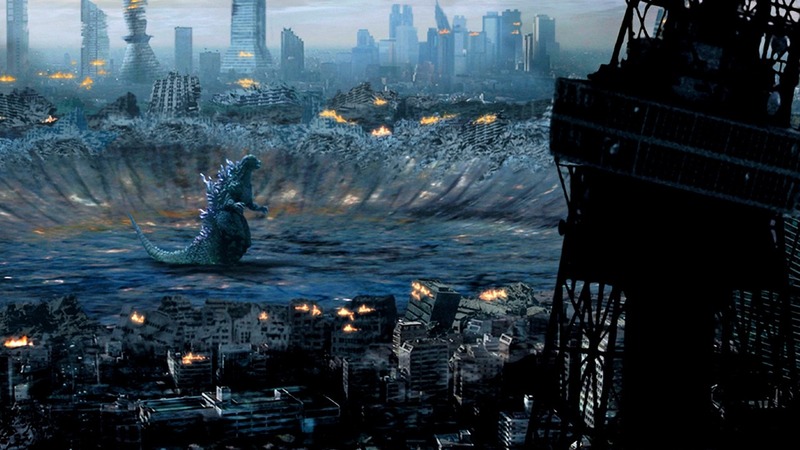 The result is that human battles involving a lot of wirework and such take up far more of the movie's running time than anything to do with Godzilla and friends at all. Some of the human battles are perfectly fine, too; most of them aren't, and even at their best, it's a palpable, irritating waste of time. The only member of the primary cast giving anything resembling a decent performance is Kitamura (who I don't believe to be related to the director), and then only because he can go over the top however he sees fit (Don Frye, veteran of MMA, gives a terrible performance, but he's at least captivatingly weird). Nobody else succeeds at being any sort of interesting focal point, which makes it immensely difficult to care about them when they get involved in sword fights or laser battles or whatever. It's a fatal flaw that the movie is so fascinated by its deeply clichéd story, the one part of the whole film that Kitamura Ryuhei plays straight; everything else is noisy, full of busy editing and heightened, eye-searing color correction, and stylish to the point of suffocation; but the plot plays out with plodding linearity. The film is giddy, at least. It is in possession of a childlike enthusiasm for monsters (played literally in one scene, through a kid in Vancouver playing with kaiju toys and excitedly watching the news that shows cities being destroyed), and that's enough to paper over the tepid fight scenes and the generally shoddy CGI - it's a huge step back from the last few films in the series on that front, spending all the money on the cast and the location shooting, and giving us crappy explosions and a very dubious Mothra in the process - since, after all, we get to see Godzilla fight damn near every monster you could hope for. It does not do so for nearly long enough, or with nearly enough impact, though, and the second quarter of the movie - when no monsters appear at all - is an arid wasteland on every front, narrative, visual, and psychological. Final Wars has some good in it, but not nearly enough, and it's a pretty rough way to say goodbye to such an iconic character. One day, no doubt, a new Japanese-made Godzilla film with a man in a suit will grace our lives; till then, we have only this weirdly misconceived sci-fi thriller to be the final word on one of the most iconic figures in cinema history.